So, Odysseus is filling the Phaeacians in, regarding his difficult journey back from the Trojan war. He tells them about going to the island of Ismarus, where they plunder and steal and basically pretend to be vikings until the locals managed to get reinforcements there and they are chased off. Now, this is not very nice behaviour at all, and Zeus then whips up a stom that sends them to the land of the Lotus-eaters. Here, they discover if you eat the fruit of the lotus, it becomes all you want to do, all other thoughts are gone, so it’s heroin, basically. The island of the heroin eaters. Odysseus manages to get his men back on this ship, where he has to lock them up (like Dot Cotton once had to do to Nick Cotton, to help him get off the junk) and they sail on. Next up is the island of the Cyclopes, and things really start to get exciting. 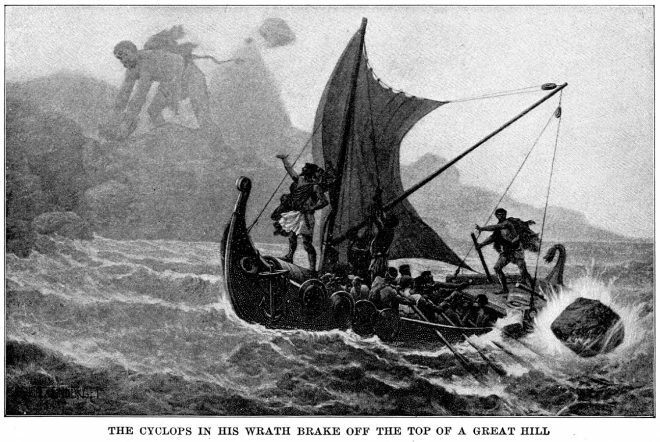 Odysseus and his men go off exploring, not really aware that the locals are one-eyed giants. They come across a cave which is full of goats and kids, sheep and lambs, and a cheese section the like the men haven’t seen since they were last in Waitrose. The men want to just steal a load of the food and get back to the ship, but Odysseus, whom we have already established in earlier books is an idiot, wants to stay to see if the owner of the cave will give them hospitality. 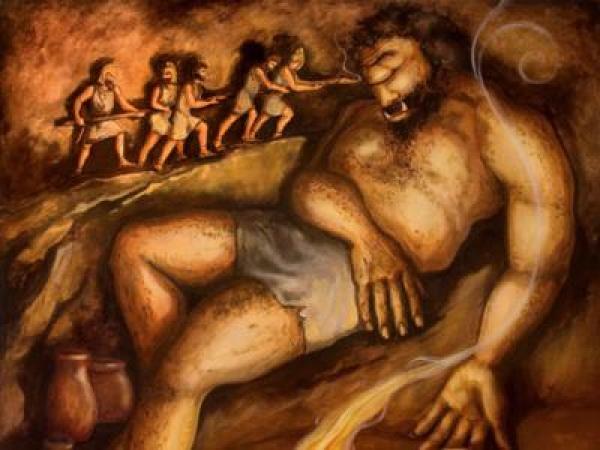 Polyphemus is the cyclops that owns the cave, and when he comes back, he reacts as I would if I found a load of men in my house demanding hospitality, and eats two of Odysseus’ men, and rolls a giant boulder across the door to stop the others escaping, sealing them for freshness and later snaking purposes. After watching more of his men get crunched up like Twiglets, Odysseus comes up with a plan. They can’t just kill the giant, as he’s the only one strong enough to get the boulder out of the way, so while the Cyclopses is out, he gets a huge wooden pole, carves it to a point, and hardens and heats it in the fire. And then, Odysseus produces some wine, and get the cyclops drunk, and once he has passed out, they charge the pointy battering ram at his one eye. He screams out in pain, and the other cyclops come running from their caves. They call out to him through the boulder door, asking if he is being killed as he sure is making enough noise about it, and waking them all up. Polyphemus, while a giant, is also a man, and puts on a show about how he is fine, nothing to see here (ba-da-bom-tish! ), everyone go back to sleep, as I presume he feels shame at having been beaten by teeny tiny men in his own home. The next day the cyclops opens the cave, and sits outside, feeling his sheep as they go out to graze, and hoping to feel the men escaping. However, Odysseus is too clever for that, no, he gets some really huge rams they tie them together in threes, with one man strapped to the belly of the middle ram, and so they get back to the ship, complete with goats for dinner. He then has a bizarrely protracted conversation with the cyclops where he gloats about having beaten him, by shouting these things to him from far out at sea, and the cyclops throws rocks out at him. In the realm of fantasy that the Odyssey inhabits, the reality and organisation needed to tie then goats together and then strap a man underneath one (like De Niro in Cape Fear) is the most unbelievable of all. 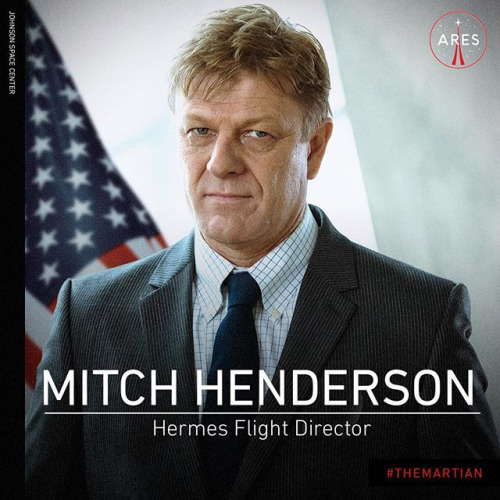 Odysseus (who for the purpose of our re-telling is Sean Bean, as that’s who he was in ‘Troy’ and that crap film has to be good for something) then has to leave the men to it for a while, as he is playing the only Yorkshireman who works at NASA in ‘The Martian’ (‘Eee, it’s a reet shame our lad is stuck oop there on’t Mars.’) There is also a scene where they have a secret meeting and call it the council of Elrond and I nearly exploded with all my Beanism joy! ← Outrunning the black dogs. It is interesting how he changes his views, as he makes a show of hospitality at first, but he soon turns hostile. Anyhow…. it seems that “Nobody” was able to beat him at the end.. This one is a very clever review on book Nine, dear Lucy… Great job, as always. This is my favourite chapter of the book, and you totally nailed it. I’ll be laughing randomly but with gusto at ‘Nothing to see here’ for weeks to come – brilliant!